Every year, thousands of tourists and island residents spend time at the beach on St. Simons Island. In an effort to keep our guests safe, here are some things to keep in mind for your next trip to the beach. Sand Bars: If you look out into the ocean at low tide, you are sure to see the sand bars as well as people swimming to them to explore them. Our advice is to appreciate the sand bar from a distance but do not swim or walk to it. The tide can change from low to high in a relatively short amount of time and returning to the beach can become quite hazardous. Swimming: Lifeguards are on duty Memorial Day through Labor Day from 11am to 4pm. Keep in mind that not all beaches are guarded. 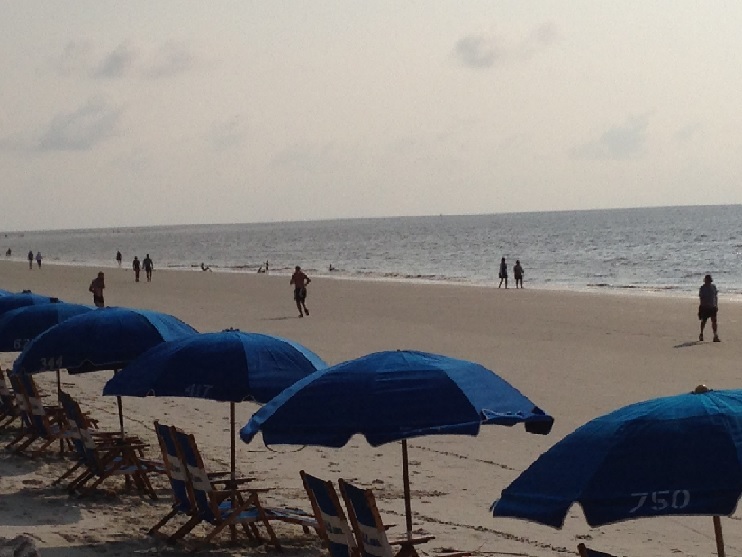 For a list of beaches, visit the Glynn County website. Although there are few waves at our beach, the water moves swiftly and there is a strong rip current. It is important if you are going to swim, that you are a strong swimmer. If you become caught in a rip current, don’t fight it. Swim or tread water until you are out of the current and then swim to shore. You can always wave to shore for help as well. Dogs on the Beach: Dogs are permitted on the beach! Here is what you need to know to bring Fido with you. During the winter months, (after Labor Day and before Memorial Day) dogs are allowed on any portion of the beach as long as they are on a leash. During the summer, (Memorial Day through Labor Day) no dogs are permitted on the beach between the pier and 16th street at Gould’s Inlet from 9am to 6pm. They are, however, permitted on the beach before 9am and after 6pm. If you have any questions about beach access points, swimming or sandbars, ask our concierge or front desk. They will be happy to assist you. Remember to stay safe at the beach this summer and have fun! This entry was posted on Thursday, May 15th, 2014 at 8:41 am	and is filed under Area Events and Info. You can follow any responses to this entry through the RSS 2.0 feed. Responses are currently closed, but you can trackback from your own site.